New images from the MAVEN mission show the ultraviolet glow from the Martian atmosphere in unprecedented detail, revealing dynamic, previously invisible behavior. They include the first images of “nightglow” that can be used to show how winds circulate at high altitudes. 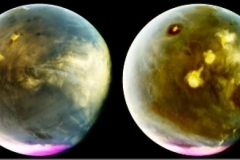 Additionally, dayside ultraviolet imagery from the spacecraft shows how ozone amounts change over the seasons and how afternoon clouds form over giant Martian volcanoes. 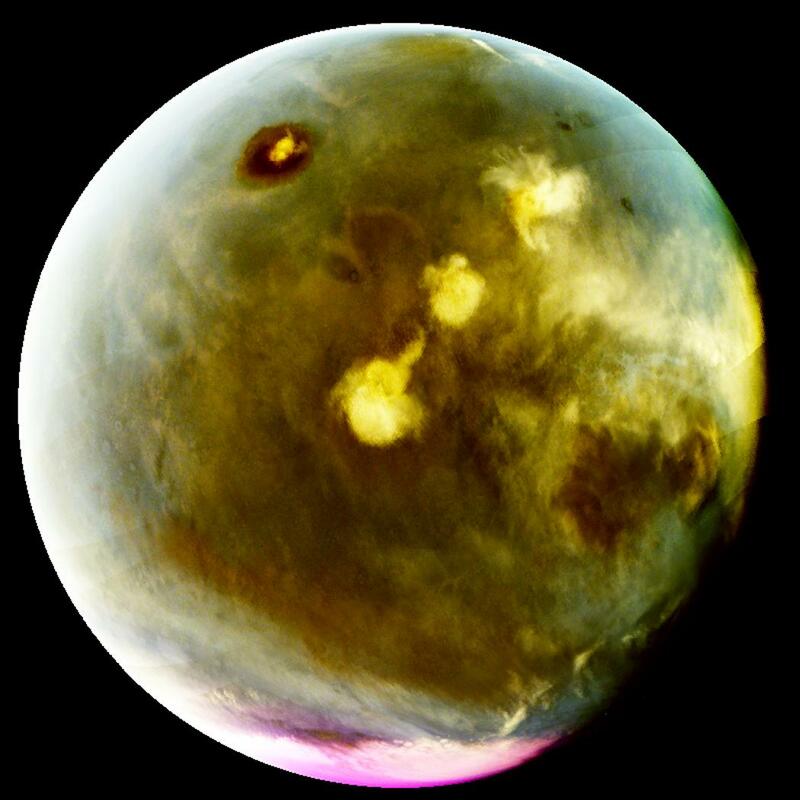 “MAVEN obtained hundreds of such images in recent months, giving some of the best high-resolution ultraviolet coverage of Mars ever obtained,” said Nick Schneider of the Laboratory for Atmospheric and Space Physics at the University of Colorado, Boulder. Schneider is presenting these results October 19 at the American Astronomical Society Division for Planetary Sciences meeting in Pasadena, California, which is being held jointly with the European Planetary Science Congress. Nightside images show ultraviolet (UV) “nightglow” emission from nitric oxide (abbreviated NO). Nightglow is a common planetary phenomenon in which the sky faintly glows even in the complete absence of external light. 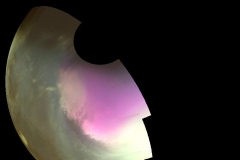 Mars’ nightside atmosphere emits light in the ultraviolet due to chemical reactions that start on Mars’ dayside. Ultraviolet light from the sun breaks down molecules of carbon dioxide and nitrogen, and the resulting atoms are carried around the planet by high-altitude wind patterns that encircle the planet. On the nightside, these winds bring the atoms down to lower altitudes where nitrogen and oxygen atoms collide to form nitric oxide molecules. The recombination releases extra energy, which comes out as ultraviolet light. Images from MAVEN’s Imaging UltraViolet Spectrograph were used to make this movie of rapid cloud formation on Mars on July 9-10, 2016. The ultraviolet colors of the planet have been rendered in false color, to show what we would see with ultraviolet-sensitive eyes. The movie uses four MAVEN images to show about 7 hours of Mars rotation during this period, and interleaves simulated views that would be seen between the four images. Mars’ day is similar to Earth’s, so the movie shows just over a quarter day. The left part of the planet is in morning and the right side in afternoon. 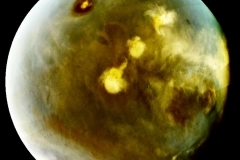 Mars’ prominent volcanoes, topped with white clouds, can be seen moving across the disk. Mars’ tallest volcano, Olympus Mons, appears as a prominent dark region near the top of the images, with a small white cloud at the summit that grows during the day. Olympus Mons appears dark because the volcano rises up above much of the hazy atmosphere which makes the rest of the planet appear lighter. Three more volcanoes appear in a diagonal row, with their cloud cover merging to span up to a thousand miles by the end of the day. These images are particularly interesting because they show how rapidly and extensively the clouds topping the volcanoes form in the afternoon. Similar processes occur at Earth, with the flow of winds over mountains creating clouds. Afternoon cloud formation is a common occurrence in the American West, especially during the summer. 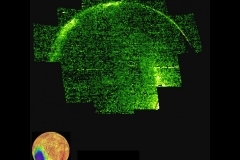 Scientists predicted NO nightglow at Mars, and prior missions detected its presence, but MAVEN has returned the first images of this phenomenon in the Martian atmosphere. Splotches and streaks appearing in these images occur where NO recombination is enhanced by winds. 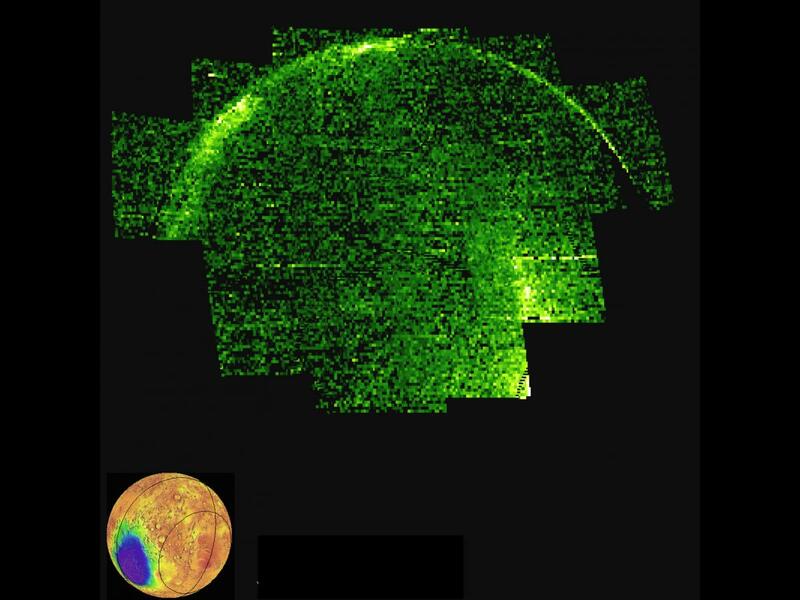 Such concentrations are clear evidence of strong irregularities in Mars’ high altitude winds and circulation patterns. These winds control how Mars’ atmosphere responds to its very strong seasonal cycles. These first images will lead to an improved determination of the circulation patterns that control the behavior of the atmosphere from approximately 37 to 62 miles (about 60 to 100 kilometers) high. Dayside images show the atmosphere and surface near Mars’ south pole in unprecedented ultraviolet detail. They were obtained as spring comes to the southern hemisphere. Ozone is destroyed when water vapor is present, so ozone accumulates in the winter polar region where the water vapor has frozen out of the atmosphere. The images show ozone lasting into spring, indicating that global winds are inhibiting the spread of water vapor from the rest of the planet into winter polar regions. Wave patterns in the images, revealed by UV absorption from ozone concentrations, are critical to understanding the wind patterns, giving scientists an additional means to study the chemistry and global circulation of the atmosphere. MAVEN observations also show afternoon cloud formation over the four giant volcanoes on Mars, much as clouds form over mountain ranges on Earth. IUVS images of cloud formation are among the best ever taken showing the development of clouds throughout the day. Clouds are a key to understanding a planet’s energy balance and water vapor inventory, so these observations will be valuable in understanding the daily and seasonal behavior of the atmosphere. MAVEN’s principal investigator is based at the University of Colorado’s Laboratory for Atmospheric and Space Physics, Boulder. The university provided two science instruments and leads science operations, as well as education and public outreach, for the mission. NASA’s Goddard Space Flight Center in Greenbelt, Maryland, manages the MAVEN project and provided two science instruments for the mission. The University of California at Berkeley’s Space Sciences Laboratory also provided four science instruments for the mission. Lockheed Martin built the spacecraft and is responsible for mission operations. NASA’s Jet Propulsion Laboratory in Pasadena, California, provides navigation and Deep Space Network support, as well as the Electra telecommunications relay hardware and operations. 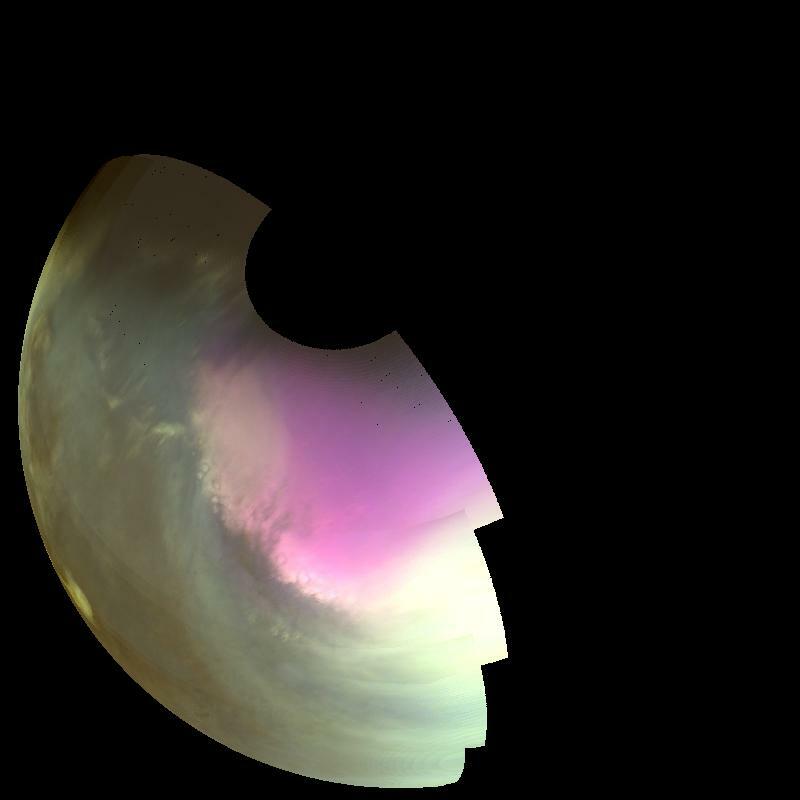 Be the first to comment on "MAVEN Mission Provides Unprecedented Ultraviolet View of Mars"